Our project “Habitat for Bush Birds” has conducted workshops and held outings to encourage bird surveys and data collection locally. But to get a clearer picture of the health of the local woodland bird populations over time and space, we still need more surveys! 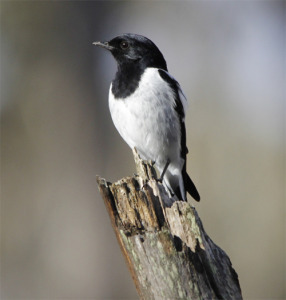 In order to harness the skills and enthusiasm of bird-watching locals and also visitors to the Box –Ironbark forests and Yellow Gum woodlands of the region, Connecting Country has established a number of Group Atlas sites, and volunteers are invited to lend a hand by undertaking one or more 20 minute counts at them. Some of our sites are regularly frequented by beautiful and declining woodland birds such as Hooded Robins, Diamond Firetails and Jacky Winters. These three species, along with the Painted Button-quail and Brown Treecreeper are identified as focal species in our Ten Year Woodland Bird Action Plan; we have called them the “the feathered five”. Any additional incidental local records would also be highly valued. Group atlas sites encourage people to establish survey sites which other birdwatchers can visit, to optimise the amount of data that can be generated at individual sites. These group sites have been created in partnership with BirdLife Australia; and developed with the beginner in mind. Each PDF has directions on finding the site easily, and survey instructions. For a comprehensive overview of becoming a bird citizen scientist for Connecting Country see the Birdwatchers Kit Dec 15 . This kit describes the types of surveys we use to collect Bird Data, including the 20 min 2 hectare survey, how to submit your records to us, and also has some information on the feathered five. The birdwatching page on this website also has some useful tips on topics such as field guides and useful websites. Whether you are a beginning or experienced birdwatcher, we hope that you will enjoy contributing your sightings to Connecting Country and BirdLife Australia. Please do not hesitate to contact Tanya Loos, Woodland Birds project coordinator with any questions.